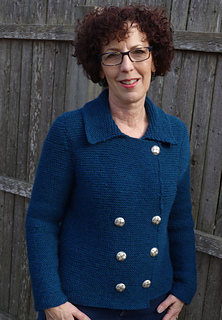 Introducing Brooklyn, a densely knit, Garter stitch “jacket,” named for one of my favorite cities. This cropped, double‐breasted design is worked flat from the top down, allowing leeway for personalized length of both bodice and sleeves. 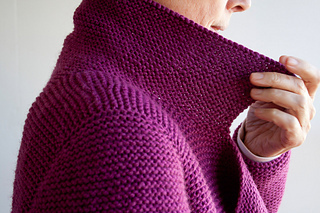 Stitches are picked up along the neckline for the collar where short rows create shaping at its back. Wear it folded over or upright, as you wish. 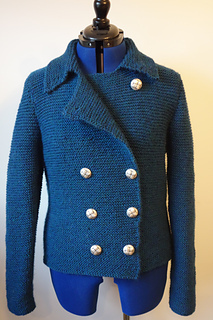 2 columns of 3 buttons enclose the overlapping front, gradually decreasing in their spacing as they move towards the hem, with 1 extra at the neckline to close up that last bit, if desired. 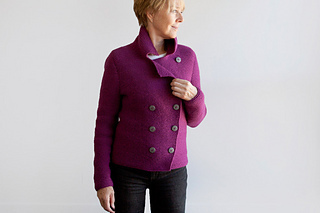 Sleeves are seamed and set in (a photo tutorial is included to ensure a positive result). Shown in size 36½“/92.7 cm, worn with no ease. 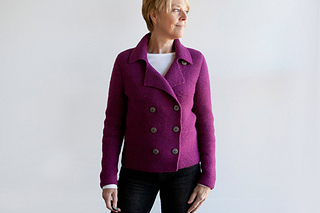 Shown in ECO + wool by Cascade Yarns. (100% Peruvian Highland wool; 478 yds per 250g skein); color – Boysenberry #3105; 3, 3, 4, 4, 5, 5, 5 skeins, or for comparable yarn, approx 1350, 1475, 1675, 1825, 1975, 2145, 2300 yards / 1235, 1350, 1532, 1670, 1805, 1962, 2105 m.
Long-tail CO, Backward loop CO, decreasing (k2tog), increasing (kfb), short row shaping, buttonholes (yo-k2tog), stitch pick-up around neckline for collar, setting in garter sleeve caps and seaming sleeves. 14 page PDF includes pattern instructions, photographs, assembly diagrams, schematics, row tracking grid for managing at-the-same-time instructions, instructional links and photo tutorials, and definitions for relevant abbreviations.